The Orb Factory Sticky Mosaics Jewelry Box is a great decorate by number arts and crafts project for girls to create and decorate their own jewelry box. You are never too young to have a special place to hold all your prized possessions. This decorate-by-number jewelry box is a simple and easy to use craft. Girls will have fun with Sticky Mosaics for hours and have a beautiful keepsake when she is done. Adorn it with jewels and gems because this kit comes with hundreds of sparkling stickers. Easy to use and fun for kids of all ages. Simply follow a numbered pattern to decorate every angle of this pretty box. 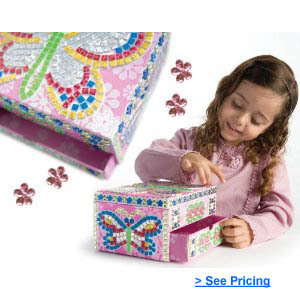 This craft box is recommended for ages 6 and up and consists of several small pieces.